I don’t do a lot of reviews on my own site, but every once in a while there’s a project out there that people really need to check out. 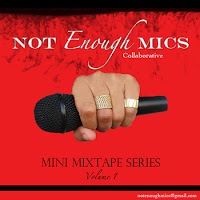 The Not Enough Mics Collaborative is a new alliance of womyn-identified artists centered around Madison, WI (though they rep different cities). I’ve written about how and why women are underrepresented in indie hip hop before, and it’s great to see a debut from a collective like this that’s so confident, creative and fun to listen to. And it’s free. After a solemn introduction from poet Thiahera Nurse, FM Supreme launches into the kind of slap-you-in-the-face rap song that can really only come from Chicago. It’s a great one-two punch of an introduction: the tension and release between an a capella spoken-word piece and a certified banger. FM Supreme may be one of the more experienced artists on the EP—she’s been doing some great things for a while now and is definitely someone to watch. K.Raydio (who now lives and performs in the Twin Cities) serves up a nostalgic slice of neo-soul over a killer Man Mantis beat next. It’s a difficult thing to do neo-soul right these days—the genre was all but ground into dust by D’angelo and Erykah Badu imitators over the past decade. But this song has just the right amount of cool, originality and swagger to make it refreshing. K.Raydio has more free stuff to check out too. Sofia Snow is one of the most talented people I know. And when I know talented people who also rap, I sometimes worry about their voices being boxed in by the traditional boundaries of hip hop. For example, someone who is a brilliant actor or spoken-word artist might feel obligated to write really cliché hip hop tracks, just to prove that they can indeed rap, rather than using their talents to push a new vision of hip hop forward. Fortunately, Snow’s track here is something very different; it’s very much a rap song, but there’s a playfulness to the patterns and complexity in the subject matter that is both intellectually engaging and a pleasure to listen to. Myriha Burton just shows up for one verse, but it’s a monstrous 28-bar mission statement, very much a Detroit hip hop track. If you’re a fan of Royce and Em and them, not to mention Invincible and Finale and them, keep a close eye on Burton. Bonnie isn’t an artist I’ve heard before, but I’m intrigued by her offering on this EP. She’s armed with a self-assured slow flow (a style I sometimes wish more rappers would employ), very different from the previous track, as well as a strong singing voice. The song as a whole comes together beautifully, capturing the bittersweet side of the struggle. Twin Cities heads may remember Pyro. Even before she moved to Madison, she was one of the strongest young voices in the Twin Cities spoken-word scene. Her song here, “4 U Know Who,” manages to be the standout on an EP full of standouts. Whether rapping or singing, Pyro’s lyrics strike the perfect balance between specific and universal, and her voice is something really special. A lot of times, when critics say that someone has a great voice, they’re referring to pure power and control. But Pyro’s voice is something more than that—a truly unique instrument capable of communicating something beyond the big notes and the vamping, something transcendent. And she has more stuff for free at this link. Including DJ BlaireBlanco’s short and sweet outro, the whole project is just over twenty minutes long. But it’s a twenty minutes that points to great, great things for the future. All in all, this EP isn’t just a collection of songs from artists who happen to identify as female; it’s one of the strongest collections of songs I’ve heard all year. Download it for FREE at this link. Get at them on Facebook at this link. And they've got a Tumblr as well.